Sunlight and Vitamin D – The first evidence that sunlight is important to health was discovered when sunlight was found to have an effect on the occurrence of rickets. Rickets is a disease of children in which the bones become soft, due either to lack of calcium or lack of vitamin D. Symptoms include deformation of bones in the legs, chest and spine. A similar condition in adults is called osteomalacia. This disease had been described as early as 500 BC, but came to greater attention in England in the late 18th and early 19th centuries. This is the time known as the industrial revolution. Every year, more and more people moved from the farms to the cities to work in factories. Even young children spent all day working in the factories. They also lived crowded into tenements. Children raised in these conditions frequently developed rickets. It was soon observed that a lack of sunlight was a common factor. However, it was not until the 1890s that sunlight was proved to be the specific cure for rickets. The reasons for its effect were not understood until the 1920s when vitamin D was discovered. A man by the name of Mellanby, who lived in London, provided the first experimental proof that rickets was a deficiency disease and could be cured by feeding cod liver oil to children with rickets. In the 1920s, many discoveries were made of elements essential to human health. These became known as vitamins. A substance was found in cod liver oil that prevented and cured rickets, so it was labeled a vitamin (vitamin D). Vitamin D is almost totally absent in vegetable foods. It occurs mainly in fatty foods of animal origin, such as egg yolk, butter, liver and fatty fishes. Fortunately, humans can make their own vitamin D from exposure to sunlight. The skin has a high concentration of cholesterol. When ultraviolet light from the sun hits the skin some of the cholesterol is changed into previtamin D. Previtamin D stays in the skin. As the sun continues to act on it, some of the previtamin D is changed into two other products, tachysterol and lumisterol, which are used by the body to form other important substances. Previtamin D is slowly changed into vitamin D by the normal heat of the body. This vitamin D is then absorbed into the blood and carried to the liver where it is changed into a more active form called 25-HCC. It then goes to the kidney where it is changed into 1-25-DHCC. This is the active form of vitamin D that is used by the body for various activities. Some of these include the formation of calcium-binding proteins in the intestines, which are necessary for the absorption of calcium from the food that is eaten; aiding in the production of enzymes that are involved in calcium transport and collagen formation in the bones; and regulating amino acid levels in the blood. Vitamin D is actually more of a hormone than it is a vitamin. It is made from cholesterol just as are the other major steroid hormones, including pregnenolone, progesterone, DHEA, testosterone, cortisol and the estrogens. The body has the ability to store vitamin D in the liver, and it has a biofeedback mechanism that prevents absorption of vitamin D from the skin if the body’s storage capacity is full. It is impossible to overdose on vitamin D that is derived from sunlight through the skin. For many years, obtaining vitamin D from dietary supplements rather than from the sun has been considered more practical. The availability of ultraviolet light does vary with season, location, time of day, and individual lifestyle, so obtaining vitamin D by food supplementation has largely replaced educating people about the benefits of sunlight. Vitamin D is added as a supplement to many food products. This includes milk, other dairy products, imitation dairy products, margarine, prepared breakfast cereals, baby food, bread and many other items. In addition to this, many people take vitamin D supplements. Vitamin D is also added to animal feed. People who eat meat and eggs get additional amounts from this source. Excess levels of vitamin D in the body can cause many harmful effects. Some of these are: magnesium deficiency of the heart, which can lead to heart attacks, elevated blood cholesterol levels, and calcium deposits in the joints and arteries. Many studies have been done that show that vitamin D obtained from exposure to sunlight is superior to that obtained from the diet in maintaining normal levels of calcium and phosphorus in the blood. To obtain a protective level of vitamin D from the sun, one only has to expose a small amount of skin to the sun for a few minutes in the middle of the day. Even in the wintertime it is possible to obtain enough by exposing the face for 15 or 20 minutes. It is also possible to build up a supply during the summer to carry one through the winter, as long as the supply is supplemented with frequent exposures of the face on sunny days during the winter. The body stores vitamin D in the liver. If the daily exposure is not consistent in the wintertime because of excessive cloudiness or long spells of very cold weather, the body will draw on the stores in the liver. Someone on a vegan diet, who eats nothing of animal origin, needs to remember to take advantage of sunny days to obtain vitamin D. The only other readily available source is fish liver oil. Most of the vitamin D fortified foods are refined or highly processed or, as in the case of milk and meat products, filled with hormones and antibiotics, and are not to be recommended as a source of nutrition. 1) Resting heart rate decreases. 3) Lactic acid accumulation in the blood during exercise decreases. 4) Cellular oxygen increases. A striking increase in the oxygen content of the blood has been shown to follow a simple exposure to ultraviolet light. This effect lasts for several days. 5) Energy and endurance increase. 8) The heart’s efficiency increases. 9) Blood sugar decreases. This effect is minimal in normal individuals, but is greater in diabetics. 10) Tolerance to stress increases. In order to obtain this increase in physical fitness with sunlight, as with exercise, a gradual consistent program must be maintained over a period of several months. It should be possible to obtain an even greater benefit by combining the two therapies. Studies have been done that show that it is not the vitamin D produced in the body that is responsible for the increased strength. Animals deficient in vitamin D develop muscle strength just as rapidly as animals that are not deficient. 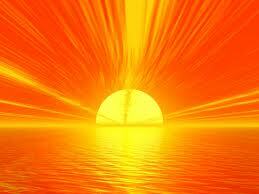 There is some factor in sunlight that is unknown, that produces the increases in strength. One study was done that showed that sunlight could increase the energy level in human cells. Sunlight is the source of energy for the plant kingdom. Man may also be able to derive energy directly from the sun. Sunlight regulates the hormonal balance of the body. Light coming into the eye sends nerve impulses that are transmitted to a small gland located at the base of the brain, called the pineal gland. This gland is intimately connected with the functioning of the pituitary gland and the hypothalamus. The pituitary gland is called the master gland, since its secretions regulate the activity of all the other glands of the body, including the adrenals and thyroid. The hypothalamus regulates autonomic responses—those that require no conscious control, such as body temperature, heart beat, respiratory rate, and hormone and enzyme secretions. The hypothalamus coordinates the activity of the endocrine system. This activity all appears to be under the control of secretions from the pineal gland, which are coordinated according to the amount of light received through the eyes. This also regulates our wake/sleep cycles. If we want to sleep well, feel good and be in health, we need to spend time every day out of doors in the sunlight. Even if it is cloudy, the level of light available is much higher than being inside with artificial lights. Don’t look directly at the sun. This can damage the eye. People who live in areas where winters are long and sunlight levels are low, can develop a condition known as “seasonal affective disorder.” In extreme cases, it can be severely incapacitating. It causes depression, withdrawal, a craving for carbohydrates, weight gain, loss of energy, and a tendency to sleep longer. It can be treated by exposure to bright light. A word of caution: ultraviolet light from so-called “sunlamps” can damage the chromosomes of cells. Ultraviolet light accompanied by the full spectrum of light from the sun does not do this. Something about full-spectrum light protects the chromosomes from damage. I do not know of any sunlamp that provides the protective full spectrum, which includes visible light, infrared light, and ultraviolet light. Light therapy is used in the treatment of jaundice in newborn infants. This is caused by a build-up of bilirubin in the skin and tissues and turns the skin yellow. It was discovered in 1956 that sunlight breaks down the bilirubin. It has since been discovered that blue light is the factor which reverses jaundice. Today, hospitals expose jaundiced infants to blue light. Sunlight has many other important benefits to health. It elevates the mood; it electrifies the air; it helps the body eliminate toxins; it relieves arthritic symptoms; and increases the body’s resistance to infections. We all need to be sure we get enough exposure to sunlight.